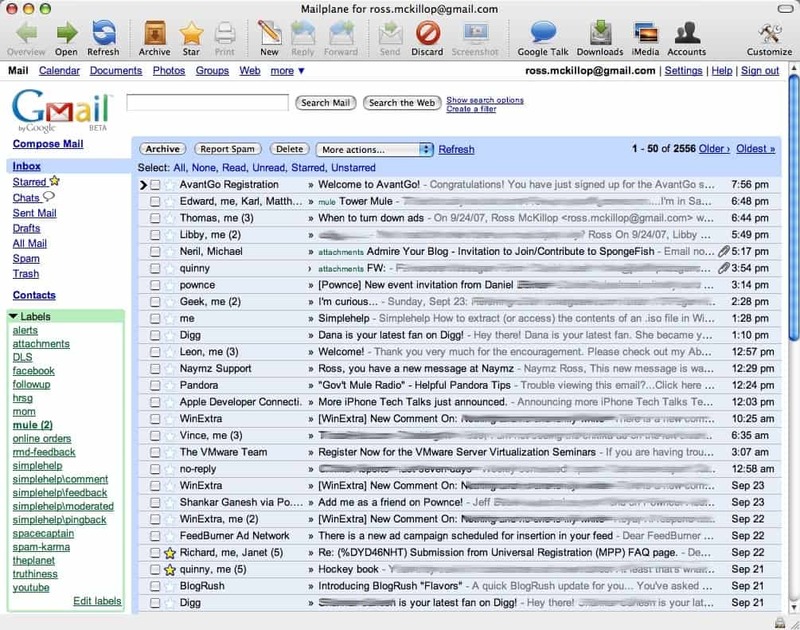 Mailplane is a stand-alone Gmail client for OS X. Besides including all of the great features of Gmail, Mailplane adds extras such as built-in drag-and-drop attachments, quick import from iPhoto and iTunes, Growl notifications when you get new messages and much more. Update: All 5 of my invites have been given away. If you’d like to sign up for an invitation to the beta program please visit http://mailplaneapp.com/beta/request_invitation.php. If you’d like an invite to the beta program, leave a comment. I have 5 invites to give away to the first 5 commenters. When first launched, Mailplane will ask a few questions. I opted to install the iPhoto plugin and check for updates when Mailplane is started, but not to make it my default mail client quite yet. These settings can be changed later, so don’t worry about them too much. Click Finish when you’re done. Enter your Gmail account info in the spaces provided. Review the optional settings as well. Click Login when you’re done. If Keyboard shortcuts are turned off on your Gmail account, Mailplane will let you know. Click the Open Google Settings button. Scroll down to the Keyboard shortcuts section, and select Keyboard shortcuts on. Then click Save at the bottom of the window. And your Inbox will open. Exactly the same as the web version, your messages display in the manner you’ve grown accustom to. But there are dozens of excellent “hidden” features. For example, you don’t have to hold down the Shift key to select multiple messages. Google Talk will pop up in its own window if you select it from the top Toolbar. And you can browse your Photos, Music and Movies by selecting iMedia from the Toolbar. A number of the user interface options can be changed if you select Tweak UI from the Preferences menu. Some of the other settings can be altered from the General tab of the Preferences menu. Growl notifications are supported, and work perfectly. And last but not least, there’s also a menu icon for Mailplane. From it you can quickly compose new messages, check for new mail etc. Too late to request a beta build? This looks great, man! Hi, also interested in an beta invite. One question, does the app provide any kind of offline editing/drafting etc? That’d spell instant redundancy for mail.app for myself. I kind of stopped following the progress of Mailplane.app since it’s invite-only beta for now, but if I can get it from express lane, I’d be all for it. Thanks! OK that’s all 5 invites sent. If I get more, I’ll be sure to offer them up here. Wow! I have been trying to make Gmail work as my default mail on my iMac. Even talked to Apple Tech Services–no go. I particulary want Gmail to open from my iPhoto when sending Email attachments. How can I get Mailplane–any way–please-please-please.